The American Health Council is proud to honor Shannon Kelly, MD as “America’s Best Doctor” for her contributions to the orthopaedic field. An attending physician at the Children’s National Medical Center — a hospital in the Children’s National Health System network — in Washington, D.C., Dr. Kelly oversees the residency and fellowship training, as well as administer orthopaedic patient care. While she has held her current role for 15 years, Dr. Kelly has spent nearly 20 years in the healthcare industry gaining comprehensive skills and knowledge in spine and cerebral palsy, minimally-invasive orthopaedic surgery, orthopaedic surgery and sports medicine, pediatric magnetically-controlled growth rod and scoliosis. A swimmer throughout her childhood and adolescence, Dr. Kelly sustained multiple shoulder injuries that required care from orthopaedics. The meticulous care she received inspired her to seek a career in orthopaedics. After earning a bachelor’s degree from Yale University in 1993, she enrolled at the University of California San Diego School of Medicine and earned a medical degree in 1998. She completed a general surgery internship and orthopaedics residency at the Mayo Clinic in 1999 and 2003 respectively. She continued her rigorous academic and professional training at the Texas Scottish Rite Hospital, where she completed a fellowship in pediatric orthopaedics in 2004. Additionally, she is board certified by the American Board of Orthopaedic Surgery. Throughout her career, Dr. Kelly authored various research publications, focusing her efforts in pediatrics. She presented her findings at various meetings, including “Childhood Hip Problems: Development Dysplasia of the Hip, Legg-Calve-Perthes Disease, Slipped Capital Femoral Epiphysis” at the Prince Georges County Medical Meeting for Orthopaedics for Primary Care in 2004, “Safety of Thoracic Pedicle Screws for Spinal Deformity in a Pediatric Institution” at the 26th Annual Brandon Carrell Meeting in 2004 and “Thoracic Pedicle Screws for Treatment of Adolescent Idiopathic Scoliosis” at the Mayo Orthopaedic Alumni Association Meeting in 2006. Additionally, she conducted research on spine and hip problems in newborns at the Holy Cross Hospital Department of Neonatology Grand Rounds and congenital clubfoot at the Howard University Department of Orthopaedic Surgery Grand Rounds, both in 2005. 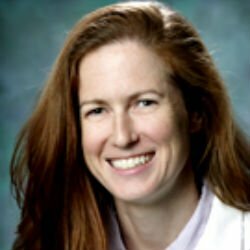 Her work is featured in the Journal of Pediatric Orthopaedics, Current Opinion in Orthopaedics and Mayo Clinic Proceedings. To continue to gain knowledge and share her expertise, Dr. Kelly is a member of several professional associations, including the Pediatric Orthopaedic Society of North America, the Scoliosis Research Society, the American Academy of Pediatrics and the American Academy of Orthopaedic Surgeries. Dr. Kelly shares her professional insight with high school and college students, as she serves as a mentor for students and director of the resident and fellow education department. With a successful career at hand, Dr. Kelly attributes her achievements to her wonderful mentors, her supportive parents who encouraged her education from the beginning, and her supportive husband. In the upcoming years, Dr. Kelly plans to work on changes to the residency program and implement those changes to the wider pediatric orthopaedic community. Children’s National Health System, based in Washington, D.C., has been serving the nation’s children since 1870. Children’s National is #1 for babies and ranked in every specialty evaluated by U.S. News & World Report and has been designated two times as a Magnet® hospital, a designation given to hospitals that demonstrate the highest standards of nursing and patient care delivery. This pediatric academic health system offers expert care through a convenient, community-based primary care network and specialty outpatient centers in the D.C. Metropolitan area including the Maryland suburbs and Northern Virginia.